A broad-gauge railway is a railway with a track gauge broader than the 1,435 mm (4 ft 8 1⁄2 in) standard-gauge railways. Great Western Railway broad-gauge steam locomotives awaiting scrapping in 1892 after the conversion of the tracks to 4 ft 8 1⁄2 in (1,435 mm) standard gauge. Broad gauge was first used in Great Britain in Scotland for two short, isolated lines, the Dundee and Arbroath Railway (1836-1847) and the Arbroath and Forfar Railway (1838-1848). Both the lines were built in 5 ft 6 in (1,676 mm). Both the lines were subsequently converted to standard gauge and connected to the emerging Scottish rail network. The Great Western Railway, was designed by Isambard Kingdom Brunel, in 1838, with a gauge of 7 ft 1⁄4 in (2,140 mm), and retained this gauge until 1892. Some harbours also used railways of this gauge for construction and maintenance. These included Portland Harbour and Holyhead Breakwater, which used a locomotive for working sidings. As it was not connected to the national network, this broad-gauge operation continued until the locomotive wore out in 1913. The gauge initially proposed by Brunel was 7 ft (2,134 mm) exactly but this was soon increased by 1⁄4 in (6 mm) to 7 ft 1⁄4 in (2,140 mm) to accommodate clearance problems identified during early testing. While the parliament of the United Kingdom of Great Britain and Ireland was initially prepared to authorise lines built to the broad gauge of 7 ft (2,134 mm), it was eventually rejected by the Gauge Commission in favour of all new railways in England, Wales and Scotland being built to standard gauge of 4 ft 8 1⁄2 in (1,435 mm), this being the gauge with the greatest mileage. Railways which had already received their enabling Act would continue at the 7 ft gauge. Ireland, using the same criteria, was allocated a different standard gauge, the Irish gauge, of 5 ft 3 in (1,600 mm) which is also used in the Australian states of South Australia and Victoria. 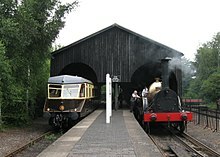 Broad-gauge lines in Britain were gradually converted to dual gauge or standard gauge from 1864, and finally the last of Brunel's broad gauge was converted over a single weekend in 1892. In 1839 the Netherlands started its railway system with two broad-gauge railways. The chosen gauge of 1,945 mm (6 ft 4 9⁄16 in) was applied between 1839 and 1866 by the Hollandsche IJzeren Spoorweg-Maatschappij (HSM) for its Amsterdam–The Hague–Rotterdam line and between 1842 and 1855, firstly by the Dutch state, but soon by the Nederlandsche Rhijnspoorweg-Maatschappij, for its Amsterdam–Utrecht–Arnhem line. But the neighbouring countries Prussia and Belgium already used standard gauge, so the two companies had to regauge their first lines. In 1855, NRS regauged its line and shortly afterwards connected to the Prussian railways. The HSM followed in 1866. There are replicas of one broad-gauge 2-2-2 locomotive (De Arend) and three carriages in the Dutch Railway Museum in Utrecht. These replicas were built for the 100th anniversary of the Dutch Railways in 1938–39. Ireland and some states in Australia and Brazil have a gauge of 5 ft 3 in (1,600 mm), but Luas, the Dublin light rail system, is built to standard gauge. Russia and the other former Soviet Republics use a 1,520 mm (4 ft 11 27⁄32 in) (originally 5 ft (1,524 mm)) gauge while Finland continues to use the 5 ft (1,524 mm) gauge inherited from Imperial Russia (the two standards are close enough to allow full interoperability between Finland and Russia). Portugal and the Spanish Renfe system use a gauge of 1,668 mm (5 ft 5 21⁄32 in) called Ancho Ibérico in Spanish or Bitola Ibérica in Portuguese (see Iberian gauge); though there are plans to convert to standard gauge. In Toronto, Canada, the gauge for TTC subways and streetcars was chosen in 1861. Toronto adopted a unique gauge of 4 ft 10 7⁄8 in (1,495 mm), an "overgauge" originally stated to "allow horse-drawn wagons to use the rails", but with the practical effect of precluding the use of standard-gauge equipment in the street. The Toronto Transit Commission still operates the Toronto streetcar system and three subway lines on its own unique gauge of 4 ft 10 7⁄8 in (1,495 mm). The Scarborough RT, however, uses standard gauge, as will the future light rail lines of the Transit City plan (including the under-construction Eglinton Crosstown line). In 1851 the 5 ft 6 in (1,676 mm) broad gauge was officially adopted as the standard gauge for the Province of Canada, becoming known as the Provincial gauge, and government subsidies were unavailable for railways that chose other gauges. This caused problems in interchanging freight cars with northern United States railroads, most of which were built to standard gauge or a gauge similar to it. In the 1870s, mainly between 1872 and 1874, Canadian broad-gauge lines were changed to standard gauge to facilitate interchange and the exchange of rolling stock with American railroads. Today, all Canadian railways are standard-gauge. In the early days of rail transport in the US, railways tended to be built out from coastal cities into the hinterland, and systems did not initially connect. Each builder was free to choose its own gauge, although the availability of British-built locomotives encouraged some railways to be built to standard gauge. As a general rule, southern railways were built to one or another broad gauge, mostly 5 ft (1,524 mm), while northern railroads that were not standard gauge tended to be narrow gauge. Most of the original track in Ohio was built in 4 ft 10 in (1,473 mm) Ohio gauge, and special "compromise cars" were able to run on both this track and standard gauge track. In 1848, Ohio passed a law stating "The width of the track or gauge of all roads under this act, shall be four feet ten inches between the rails." When American railroads' track extended to the point that they began to interconnect, it became clear that a single nationwide gauge was desirable. Six-foot-gauge railroads (6 ft [1,829 mm]) had developed a large regional following in New York State in the first part of the 19th century, due to the influence of the New York and Erie, one of the early pioneering railroads in America, chartered in 1832, with its first section opening in 1841. The builders and promoters decided that a six-foot track gauge would be needed for locomotives to be larger and more powerful than were in general use at the time, for pulling very large trains. Also the six-foot gauge provided greater stability, and the New York and Erie would operate passenger cars up to 11 feet (3.4 m) wide. Building westward from the Hudson River, it eventually reached Lake Erie, establishing a mainline longer than 400 miles (640 km) providing a shortcut to the American Midwest region from the New York City vicinity, and helping spawn a regional network of six-foot-gauge railroads almost exclusively within New York State. Many early New York railways were Erie railroad-built branch lines, while others were independent railroads that wanted to partner and interchange with the Erie. These included the Walkill Valley, the Albany and Susquehanna (later part of the Delaware and Hudson); the Elmira, Jefferson & Canandaigua (later the Northern Central, becoming part of the Pennsylvania Railroad); the Delaware, Lackawanna and Western mainline (which also had a significant amount of trackage in Pennsylvania); predecessor lines of the New York and Oswego Midland (later the New York, Ontario, and Western); and the Canandaigua and Niagara Falls (later becoming part of the New York Central railroad's Peanut Route along the shoreline of Lake Ontario). However, by the late 1870s, the trend was inevitable, and conversion to standard gauge began, some lines first becoming "dual gauged" with the addition of a third running rail. Between 1876 and 1880, most of the remaining six-foot gauge trackage was converted. In 1886, the railways in the Southern United States agreed to coordinate changing gauge on all their tracks. After considerable debate and planning, most of the southern rail network was converted from 5 ft (1,524 mm) gauge to 4 ft 9 in (1,448 mm) gauge, nearly the standard of the Pennsylvania Railroad, over two days beginning on 31 May 1886. Over a period of 36 hours, tens of thousands of workers pulled the spikes from the west rail of all the broad-gauge lines in the South, moved them 3 in (76 mm) east and spiked them back in place. The new gauge was close enough that standard-gauge equipment could run on it without difficulty. By June 1886, all major railroads in North America were using approximately the same gauge. The final conversion to true standard gauge took place gradually as track was maintained. Some North American tram (streetcar) lines intentionally varied from standard gauge. This may have been to make the tram companies less tempting targets for takeovers by the steam railways (or competing trams companies), which would be unable to run their trains over the tram tracks. A gauge in use is the Pennsylvania trolley gauge of 5 ft 2 1⁄2 in (1,588 mm), still used on the streetcars in New Orleans, and the Pittsburgh Light Rail system. This gauge was also used for the now defunct Pittsburgh Railways, West Penn Railways, and trams in Cincinnati. Similar 5 ft 2 1⁄4 in (1,581 mm) gauge is used in Philadelphia on the SEPTA routes, 15, 101 and 102, the Subway–Surface Trolleys and the SEPTA Market-Frankford. The Bay Area Rapid Transit (BART) system in the San Francisco Bay Area was opened in 1972 with 5 ft 6 in (1,676 mm) gauge, and thus requires all related equipment to be custom built. The system trackage has been extended multiple times since then, and new railcars have been ordered with this non-standard gauge. The use of a non-standard gauge precludes interoperability of rolling stock on railway networks. On the British Great Western Railway the 7 ft 1⁄4 in (2,140 mm) gauge was supposed to allow high speed, but the company had difficulty with locomotive design in the early years, losing much of the advantage, and rapid advances in permanent way and suspension technology allowed standard-gauge speeds to approach broad-gauge speeds within a decade or two. On the 5 ft 3 in (1,600 mm) and 5 ft 6 in (1,676 mm) gauges, the extra width allowed bigger inside cylinders and greater power, a problem solvable by using outside cylinders and higher steam pressure on standard gauge. In the end, the most powerful engines on standard gauge in North America and Scandinavia far exceeded the power of any broad-gauge locomotive. This gauge was first used in the United Kingdom and the United States before it became the standard gauge for most railways in the former Soviet Union. Russian gauge or CIS gauge 1,520 mm (4 ft 11 27⁄32 in) is the second most widely used gauge in the world, and spans the whole of the former Soviet Union/CIS bloc including the Baltic states and Mongolia. Finland uses 1,524 mm (5 ft). The difference is clearly lower than the tolerance margin, so through running is feasible. Care must be taken when servicing international trains because the wear profile of the wheels differs from that of trains that run on domestic tracks only. When the Finnish rail network was founded in 1862, Finland was the Grand Duchy of Finland, a region of Imperial Russia. The first border crossing railway to Russia was opened in 1870, while the first to Sweden was not until 1919, so railways were built to the broad Russian track gauge of 1,524 mm (5 ft). In Russia, this gauge was re-standardized to 1,520 mm (4 ft 11 27⁄32 in) during the 1960s. Finland retained the original gauge with no re-standardisation. 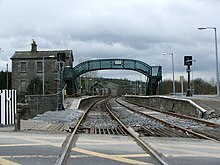 As part of the railway gauge standardisation considered by the United Kingdom Parliamentary Gauge Commission, Ireland was allocated its own gauge, Irish gauge. Ireland then had three gauges, and the new standard would be a fourth. The Irish gauge of 1,600 mm (5 ft 3 in) is used in Ireland and parts of Australia and Brazil. A problem with the Irish Gauge in Australia is that it is only about 170 mm (6.5 in) wider than the standard gauge used in other parts of Australia, principally New South Wales. Therefore, it is not considered advisable to use a third rail to allow dual-gauge operation on mainline sections of track, because of the danger of material lodging between the two rails. There has been argument for well over a century about the practicability of third rail operation, and numerous devices have been promoted to overcome the problem, especially at turnouts, including the "Brennan Switch". As finally established, the Iberian gauge of 1,668 mm (5 ft 5 21⁄32 in) is a compromise between the similar, but slightly different, gauges first adopted as respective national standards in Spain and Portugal in the mid-19th century. The main railway networks of Spain were initially constructed to a 1,672 mm (5 ft 5 13⁄16 in) gauge of six Castilian feet. Those of Portugal were initially built in standard gauge, but by 1864 were all converted to a 1,664 mm (5 ft 5 1⁄2 in) gauge of five Portuguese feet – close enough to allow interoperability in practice. The new high-speed network in Spain and Portugal uses standard gauge. The dual-gauge high-speed train RENFE Class 130 can change gauge at low speed without stopping. The 5 ft 6 in (1,676 mm) gauge was first used in Great Britain in Scotland for two short, isolated lines, the Dundee and Arbroath Railway (1836-1847) and the Arbroath and Forfar Railway (1838- ). Both the lines were subsequently converted to standard gauge and connected to the Scottish rail network. Later this gauge was adopted as a standard for many British colonies such as Province of Canada and British India. In 1851, the 5 ft 6 in (1,676 mm) broad gauge was officially adopted as the standard gauge for the Province of Canada, becoming known as the Provincial gauge, and government subsidies were unavailable for railways that chose other gauges. In the 1870s, mainly between 1872 and 1874, Canadian broad-gauge lines were changed to standard gauge to facilitate interchange and the exchange of rolling stock with American railways. Today, all Canadian railways are standard-gauge. In US, this gauge was adopted for many lines, but soon fell out in favour of standard gauge. Today, only BART uses this gauge. In British India, some standard gauge freight railways were built in initial period, though they were dismantled later. Later, in 1850s, the gauge of 5 ft 6 in (1,676 mm) was adopted as standard for the nationwide network. Attempts to economize on the cost of construction led to the adoption of 1,000 mm (3 ft 3 3⁄8 in) gauge and then 2 ft 6 in (762 mm) and 2 ft (610 mm) narrow gauges for many secondary and branch lines. In the later part of 20th century, due to interchangeability and maintenance issue, the railways in each of the countries in the Indian Subcontinent began to convert all metre-gauge and narrow-gauge lines to this gauge. Today, the nationwide rail network in Pakistan, Sri Lanka and Nepal is entirely on this gauge, whereas India and Bangladesh are still undergoing gauge conversion. This gauge is the widest gauge in regular passenger use in the world. Large telescopes and telescope arrays. Rocket launchers – The European Space Agency, Russian Federal Space Agency, NASA and SpaceX use double-track railway to move rockets and supporting equipment at launch sites (with exceptions such as the US Apollo program and Space Shuttles, which used caterpillar tracks on a river stone roadbed because other solutions could not support the loads required). Gantry crane for unloading cargo from ships, loading cargo onto ships and for constructing ships. Funiculars, Incline elevator and Canal inclined plane, for transportation on sloped way. These applications might use double track of the country's usual gauge to provide the necessary stability and axle load. These applications may also use much heavier than normal rails, the heaviest rails for trains being about 70 kg/m (141 lb/yd). Vehicles on these gauges generally operate at very low speeds. A P. G. Wodehouse character, Roderick Spode, suggests widening the rails of the entire British railway network so sheep may stand sideways on trains. ^ John F. Stover (1995). History of the Baltimore and Ohio Railroad. Purdue University Press. ^ Wright, Geo. B. (1868). Annual Report of the Commissioner of Railroads and Telegraphs to the Governor of the State of Ohio for the Year Ending June 30, 1868. Google Books: State of Ohio. p. 329. ^ "The Days They Changed the Gauge". southern.railfan.net. Retrieved 3 September 2012. ^ "Columbus' Streetcar Track Gauge: 5'2" vs 4'8 1/2"". Columbus Railroads. Retrieved 22 March 2011. ^ Hilton, George W.; Due, John Fitzgerald (1 January 2000). The Electric Interurban Railways in America. Stanford University Press. ISBN 978-0-8047-4014-2. Retrieved 10 June 2014. Worst of all, not all city systems were built to the standard American and European gauge of 4'-​8 1⁄2". Pittsburgh and most other Pennsylvania cities used 5'-​2 1⁄2", which became known as the Pennsylvania trolley gauge. Cincinnati used 5'-​2 1⁄2", Philadelphia 5'-​2 1⁄4", Columbus 5'-2", Altoona 5'-3", Louisville and Camden 5'-0", Canton and Pueblo 4'-0", Denver, Tacoma, and Los Angeles 3'-6", Toronto an odd 4'-​10 7⁄8", and Baltimore a vast 5'-​4 1⁄2". ^ "Third Rail System: Increased Danger Alleged". The Argus. 12 March 1926. Retrieved 3 September 2012. ^ "Break of Gauge". The Sydney Morning Herald. National Library of Australia. 13 April 1915. p. 10. Retrieved 26 August 2011. ^ "Comrade Bingo". Jeeves and Wooster. 27 minutes in.